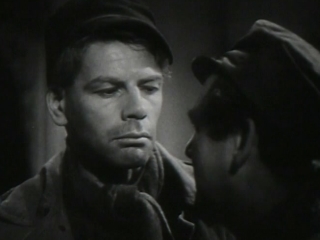 When his girlfriend (Karen Morley) leaves him for a chance at city-life with a policeman (William Gargan), a heart-broken coal miner (Paul Muni) is lured by a corrupt agitator (J. Carroll Naish) into leading a new union, much to the chagrin of his union-abiding friend Joe (John Qualen) and Joe’s wife (Sara Haden). Based on the real-life murder of a Pennsylvania coal miner in 1929, this controversial Warner Brothers drama suffers from an over-the-top performance by Paul Muni as a Polish-American miner whose poor decision-making during a night of drunken sorrow leads to irreparable harm. While corruption between Big Bosses, labor unions, and employees clearly exists in countless professions across the globe, the storyline presented here is overly simplistic, and fails to provide viewers with anything other than a melodramatic tale of the tragic downfall and heroic redemption of a “likable man”. Muni’s accent and dialect — while perhaps realistic — are laid on so thick they’re distracting; and it’s hard to root for someone who may be well-meaning but ultimately comes across as a naive dupe. Note: The film’s title doesn’t help its staying power, given that one would naturally expect such a movie to be about African-Americans. No; this one is only must-see for Muni completists. First viewing – in total agreement with the assessment; not must-see. ‘Black Fury’ is single-handedly undone by Muni’s embarrassing, one-note, canned ham performance. In classic cinema, Muni is the ‘master’ of surface acting – it’s no wonder his films are generally not talked about. Off-hand, I can’t recall a film of his in which the director was strong enough to rid Muni of his wrong-headed approach to playing characters. Or maybe he just didn’t know how to act. But God knows how Muni was able to have any kind of lasting career. I’m just realized I haven’t yet written about his biggest titles (“Scarface”, “Life of Emile Zola”, “Story of Louis Pasteur”, “Good Earth”.